On Thursday 26th March Everton in the Community – the official charity of Everton Football Club – will be giving business executives from across Liverpool the opportunity to do their part to tackle poverty deprivation and disadvantage across Merseyside as it hosts the North West’s CEO Sleepout event at Goodison Park. In partnership with Church Urban Fund and Together Liverpool, the event will see over 40 of the city’s leading business figures joining forces to spend one night sleeping outdoors all to raise awareness and vital funds to improve the lives of some of Merseyside’s poorest and most marginalised people, giving up their beds to help those who don’t have one whatever the weather may be. With Liverpool being rated as the most deprived local authority in England, poverty is an issue that affects thousands of lives. Working with Together Liverpool and the Diocese of Liverpool, Church Urban Fund have already supported nearly 400 projects in Liverpool to a value of £4.2 million, going some way towards changing lives for the better. To date, CEO Sleepout events have raised over £300,000 around the UK, with an average of £1,000 per participant being raised at each event. 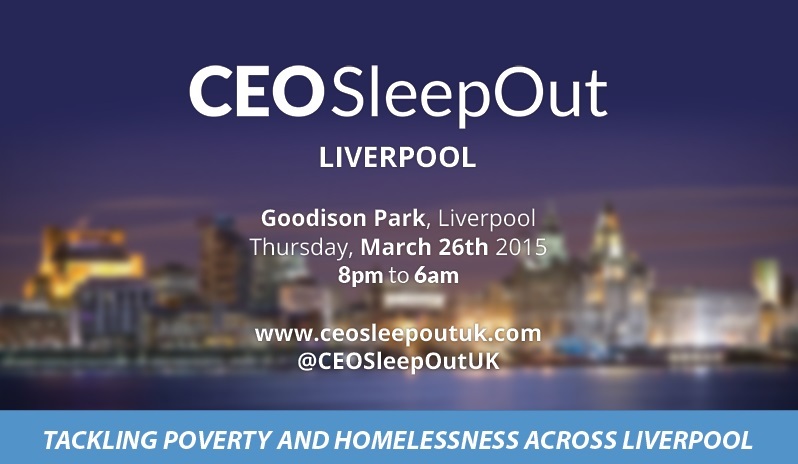 One of the executives taking part in CEO Sleepout Liverpool is Steve Hawkins, Chief Executive of Local Solutions and former trustee of The Reader Organisation. Being aware of the impact deprivation has on people’s lives having started his career working in a night shelter at Liverpool Metropolitan Cathedral’s crypt, the work Steve does at Local Solutions has seen thousands of homeless people being provided with accommodation and initiatives to prevent poverty. Taking part in this special event will help to do even more for the city’s poorest – and as a diehard Liverpool fan, spending a night at Goodison is no easy task!